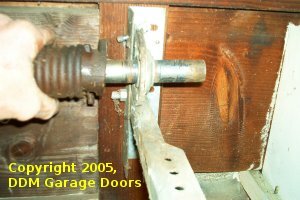 Older Crawford garage doors had unique torsion spring hardware. 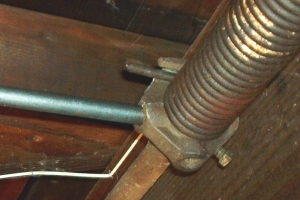 In the center of the torsion shaft is a support bracket. 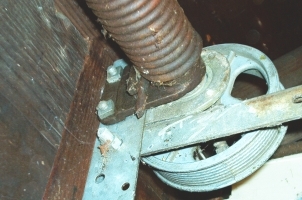 One end of each spring is mounted at the end next to the bearing plate and cable drum as pictured below. The springs normally have 1 19/32" inside diameters with extended ends to secure the springs to the cones. 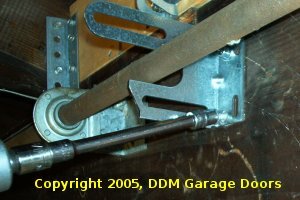 Notice here the extended end and the larger 5 1/2" spoked cast aluminum cable drum. 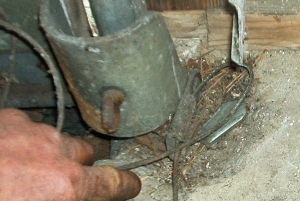 Many older Crawford drums were made of cast iron. Standard residential drums are now 4" in diameter, and they are made of cast aluminum alloy. At the other end of the spring toward the middle of the door is the winding cone. The older cones use 5/8" bars for winding. Notice the extended end that locks into the winding cone just as it does in the stationary end above. 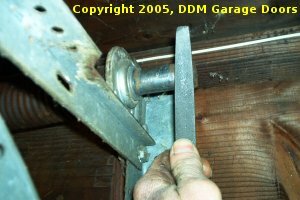 The following instructions are for converting your Crawford garage door torsion springs to standard hardware. 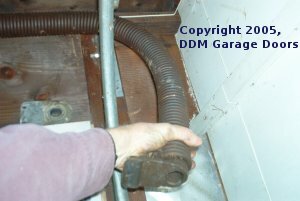 They are to be used in conjunction with the instructions for replacing torsion springs. Please review that page before using these directions. CAUTION! 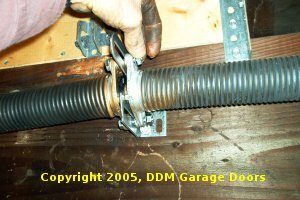 Torsion spring replacement is dangerous because the springs are under tension. If you do not use the right tools and follow safe procedures, you could lose fingers, limbs or even your life. You could also damage property. We want your business, but not at the expense of your well being. Doing the job right is your responsibility. If you have any doubts about your ability to perform the work safely, we recommend you hire a professional. It is impossible to cover every dangerous situation you may encounter. 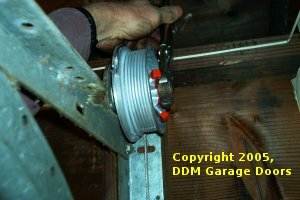 The directions below hopefully will help guide you in safely converting your Crawford torsion assembly to a standard assembly, but there are no guarantees. Pay special attention to the warnings that appear in red. 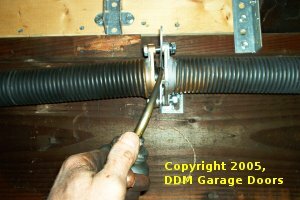 Before proceeding review the safety warnings on our Torsion Spring Replacement Page. 1. To begin, gather the tools you'll need. 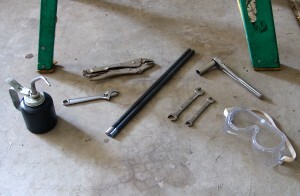 You'll need a minimum of one or two 10" vise grips, an adjustable wrench, two 5/8" X 18" and two 1/2" X 18" winding bars. Most hardware stores sell 36" steel rods that can be cut in half. You'll also need a firm ladder. A ruler and a file may also be needed, and a socket wrench and sockets would shorten the time required. 2. If you have an opener attached to your door, unplug the power cord. 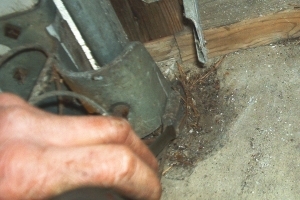 Some older openers are hardwired and you will need to remove a fuse or flip the circuit breaker. 3. 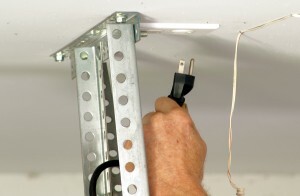 Install the new spring anchor bracket with three 5/16 X 2" lag screws. The third screw goes on the bottom if the springs are to be wound up and on the top if the springs are to be wound down. 4. Remove the old Crawford center support bracket. 5. It is now time to unwind the unbroken spring. 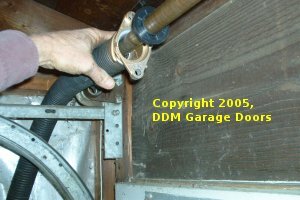 On most older Crawford doors the cable comes off the cable drums on the front side facing the inside of the garage. These springs are wound down. 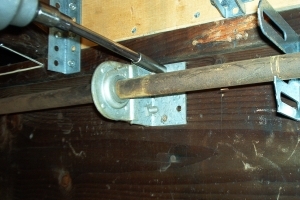 Test the strength of the spring first by inserting a 5/8" bar and pulling down on the bar. The cables will loosen. Next, loosen the set screws. 6. Raise the bar and let it rest against the ceiling or joist. Next, insert a second bar in the next lower hole. Remove the top bar and raise the lower bar to the ceiling. Repeat this process until the spring is fully unwound. 7. Next, loosen the set screws of the cable drums and remove the drums from the shaft. 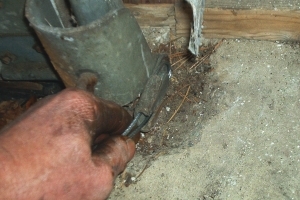 The shafts often have protruding set screw burs that will require you to beat on the drums with a hammer. 8. File away the set screw burs until the end of the shaft is smooth. 9. 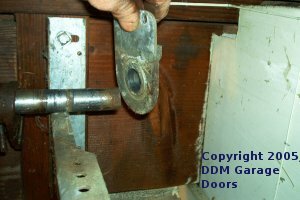 Remove the two nuts that secure the stationary plug and the end bearing to the vertical jamb angle. 10. Separate the stationary plug from the vertical angle. 11. 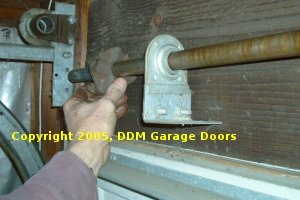 Remove the bolts and end bearing plate from the vertical angle. 12. Slide the old spring and cones off the end of the shaft. 13. Slide the new spring and cones onto the torsion shaft. 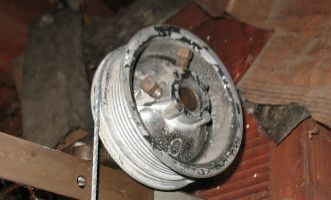 If the cable comes off the back of the drum install the left wind spring with the black winding cone on the right side. 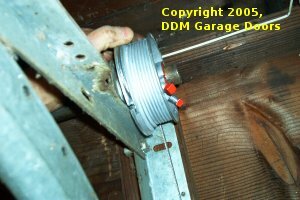 If the cable will be coming off the front of the drum facing the inside of the garage, install the right wind spring with the red cone on the right side. 14. 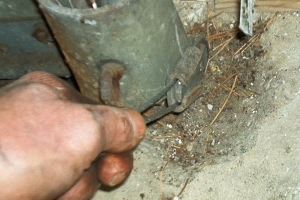 Continue by sliding the spring toward the center anchor bracket. 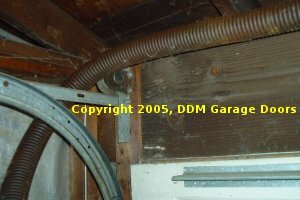 On this job we switched the springs and drums so the cable would come off the back of the drums and the new springs would wind up instead of down as the old springs did. 15. Secure the shaft inside the new center bracket with a vise grip. 16. 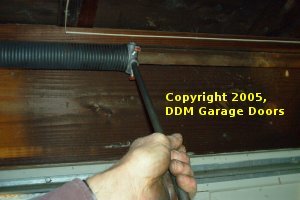 Remove the cable drum on the opposite side and slide the shaft 12" to the right. Next, remove the old spring on the left side. 17. 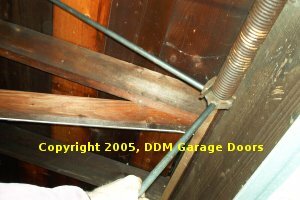 Slide off the torsion spring, cones and old center support bracket. 18. Slide on the new bushing or bearing and the new spring. 19. 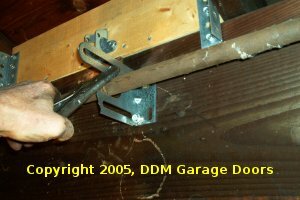 Remove the left spring anchor bracket and reinstall the end bearing brackets on both sides with the bolt heads on the outside and the nuts inside the bracket so the cable drums will not scrape the bolts. Center the shaft between the end bearings so the amount of shaft extending beyond the bearings is the same on both sides. 20. It is now time to replace the cables. On the bottom fixture the cable is secured with a movable eye that slides in the retainer. Place the end of a screw driver on the eye as pictured and tap the other end of the screw driver with a hammer. 21. Remove the eye and the old cable. Notice the eye to the right of the bottom fixture. 22. Slide the cable through the retainer and loop it around the eye. Pull the eye and cable into the retainer. 23. Extend the bottom of the cable about 9" beyond the retainer. Pull on the cable and eye until they are tight in the retainer. Follow this procedure to replace the other cable. 24. 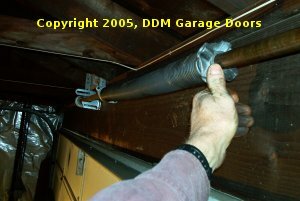 Install the cable drum on the shaft and secure it by tightening the set screws. 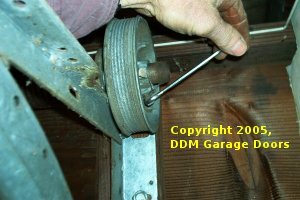 Check to make sure the drum does not scrape the angle or bolts. Install spacers or washers between the drums and the bearings if needed. 25. Insert the top of the cable into the drum and wind the cable onto the drum. The top of the cable should wrap half way around the drum. 26. Vise grip the end of the shaft with the top of the grip against the header. 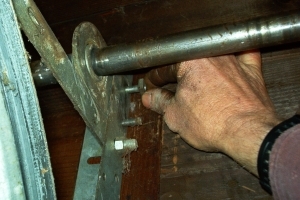 If the cables are to wrap around the fronts of the drums you will grip the vise grip so the other end of the grip is under the shaft tight against the jamb. Go to the the other side and install the cable and drum on the end of the shaft. Wrap the cable around the drum, turn the drum so the cable is tight, and then secure the set screws. Both drums should be tight against races of the bearings. 27. Both cables should be equally tight, with the same length of cable extending from the retainers. The cable length and tension can be adjusted by tapping the eye and loosening it enough to shorten or lengthen the cable. 28. 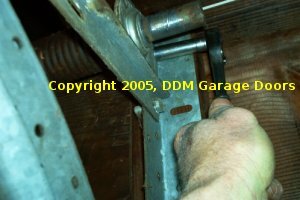 At this point you will mount the springs to the center spring anchor bracket. 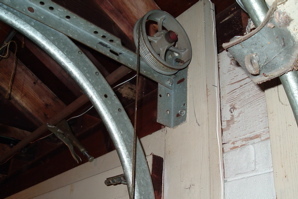 Run the bolts through both cones and the center bracket and start the nuts on the bolts. Lubricate the bearing or bushing. 29. 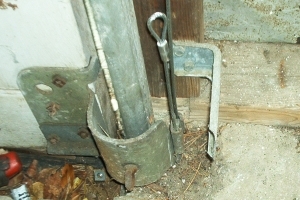 Secure the stationary cones to the center spring anchor bracket. First, finger-tighten the nuts until the cones are flush against the plate. 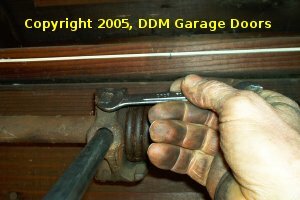 Next, tighten the nuts with a wrench or socket. 30. Carefully follow step 10 to the end of the spring replacement instructions to wind the new springs. 31. If the cables come off the fronts of the drums you will be winding the springs down instead of up. You will need to remember to reverse those directional details. 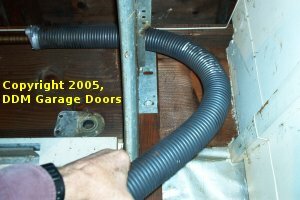 More information is on our Crawford Garage Door Spring Conversions blog.